A warm and elegant home with a system to match. Recessed pockets throughout the home for disappearing TVs, touchscreen controls on the walls, zero edge speakers that blend into the ceilings in all room controlled by a touch of a button on any device. As well a dedicated lounge-bar entertainment system with an adjoining immersive thx cinema room and lighting/climate control all work seamlessly in the background to let the real stars of this home shine through, impeccable build quality and stately design. This build exemplifies why Vancouver is one the best places to live. Mountain and ocean views wrap around this Battersbyhowat design eschewing all the traits that make this an instant classic. 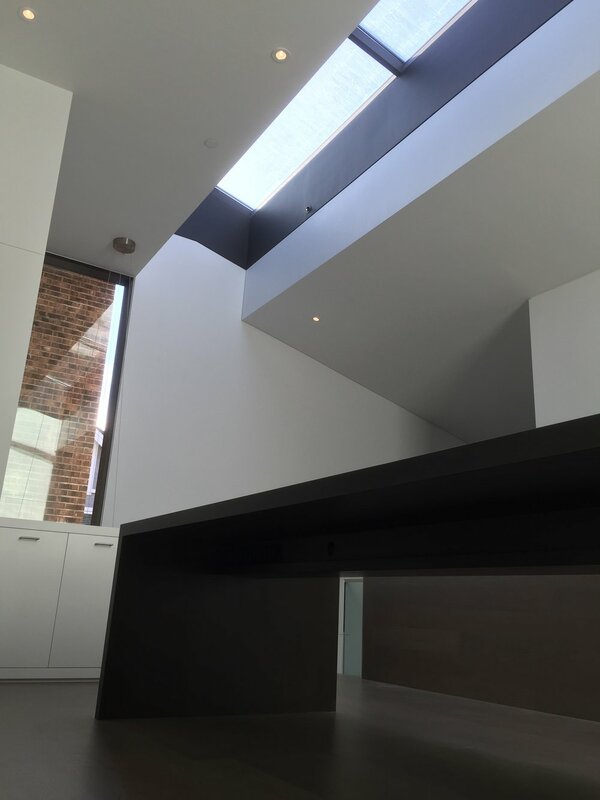 We were proud to provide the low voltage for this modern build pairing technology with the minimal clean lines of this home. Things we love are the built ins hiding the audio/video display devices when not in use with seamless cabinetry and speakers hidden low in the walls of the panoramic rooftop deck while enjoying the view. This home vibes French estate with all the modern touches of technology. Beautiful sound invisibly spreads throughout the house, touch screens blend in with the wainscotting, automated lighting sets that gentle soft mood and a killer theatre room for the whole family to watch blockbusters on Netflix. An established neighbourhood gets a new Look. This is a story where all chapters leave you wishing you were there, imagine a house that removed all the unnecessary clutter and allowed you to roam freely from room to room listening to your favourite concerta as you gaze outside through oversized windows..too bright? hit a switch and watch blinds automatically go down, feel like floating? just walk down the suspended stairs to your entertainment system where a large screen awaits you, feel antsy just look right where a window looks out to a rock wall cascading down easing your spirit. This is a livable system in a livable house, a West Coast Modern done by some of the best. Elegant, timeless and brave are words that describe this ground up restoration designed by Tereza Bajan evoking scenes from Architectural Digest. 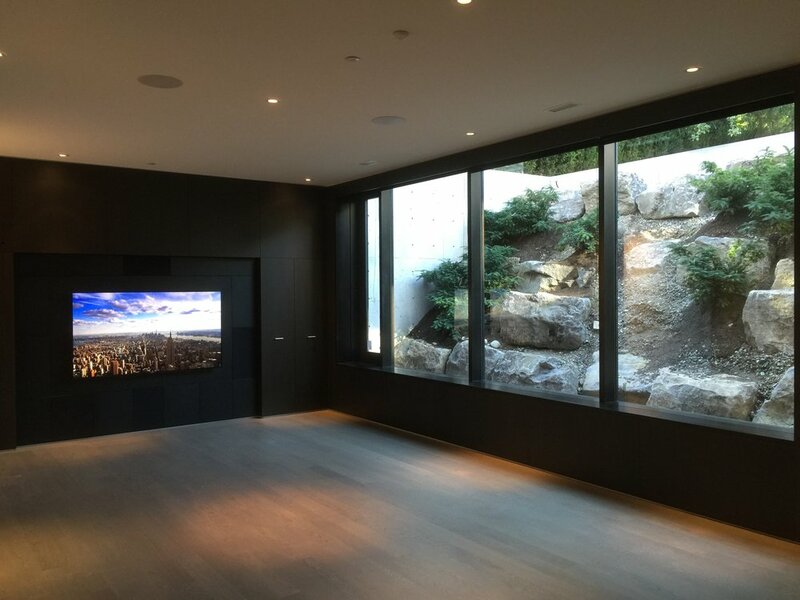 It was our privilege to provide the technology in this home and showcase how integration packages can be integrated without conflicting or impeding design throughout a home and be almost invisible. Large and impressive not only from the outside but its spacious flowing interior truly make this a classic build. We worked closely with our client to design a system to centralize and automate the key components in the house such as lighting, temperature control, sound-vision and even access control for the gates/doors into a efficient and easy to use system in this spacious home.